Brother versus brother! Our FF6 vs CT poll was actually very close, and I'm pleased to see FF6 got this far. NW redeemed itself after voting off Harvest Moon 64 and Little King's Story painfully early! Regardless, I'm happy that my top three 3rd-party games are all in this poll...! I have played three of these games to some degree, only one to completion, and I loved it. (Chrono Trigger) I wonder how my voting would be though if I had played and beaten all of these. I've played through FF6, CT, and RE4 multiple times apiece. They're good stuff. I'm not as smitten with Portal as everyone else seems to be, although I probably would've enjoyed Portal 2 if I played more of it. Resident Evil 4 is the game I never touched. Then goes FFIV, Portal 2, and Chrono Trigger in terms of time played from least to greatest. I've played and enjoyed all of these. Tough calls. First one was easy, Chrono is one of my favorite RPGs while I got to FF VI late so I don't have the same feelings for it that a lot of people do, despite recognizing why people do. Second was easy as well, Resident Evil 4 is one of my favorite games OF ALL TIME, while Portal 2 is just really, really good. With that said Portal 2 might have a shot at going all the way. That'd be a bit... odd, for a Nintendo site. I get it though, it's a spectacular game and it definitely has Nintendo-style appeal. Resident Evil 4 is an even more spectacular game though, in my opinion. Though maybe with a bit less Nintendo-style appeal. - Never played ff6, but still I think Chrono would be more likely my style. - I haven't played RE4 in so long. I bought the Wii version but never got out of the first village. I should finish that one of these days. This is a curious result so far. 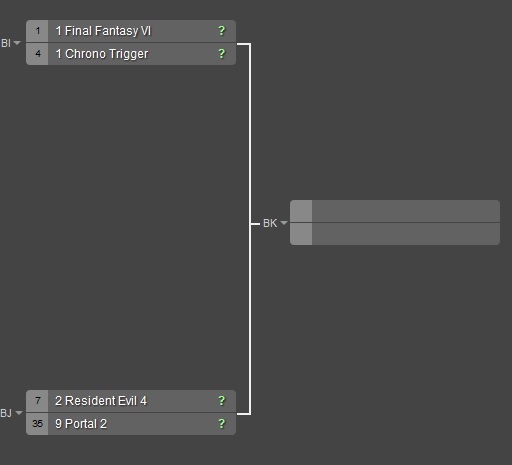 The recent poll topic about FF III/VI and Chrono Trigger was very close, but here, it's been much more one-sided. I wonder if the voting is from different crowds? That first matchup isn't even fair. It's like choosing which I like more: apple or peach pie. Oh Good Lord.. I avoided the question on that other thread, and here it is again. Terrible. Chrono Trigger has been rated 9.8 to Final Fantasy III's 9.6 in my database since I scored them. I think Final Fantasy III is easier to pick up and play, and if you asked me which game I'd prefer to play RIGHT NOW, I'd pick Final Fantasy. Chrono Trigger though..nostalgia is running rampant for that game still. As I've said many times though, I'm AFRAID to play it again. One of these months, I'm going to play both of these games back to back.